All participants will receive an innovative Snowman Stampede gender specific technical running shirt. All finishers will get a finishers medal. A fun and festive atmosphere with more than 20 vendors. Indulge in cookies, muffins, oranges, bananas, and bagels at the post race party. Fully supported course with aid stations every two miles. A safe course free from vehicular traffic, with medics on bikes patrolling the race. Stay warm in The Inn at Hudson Gardens before the race. Gift certificate awards from Runner’s Roost. Professional photo downloads after the event. 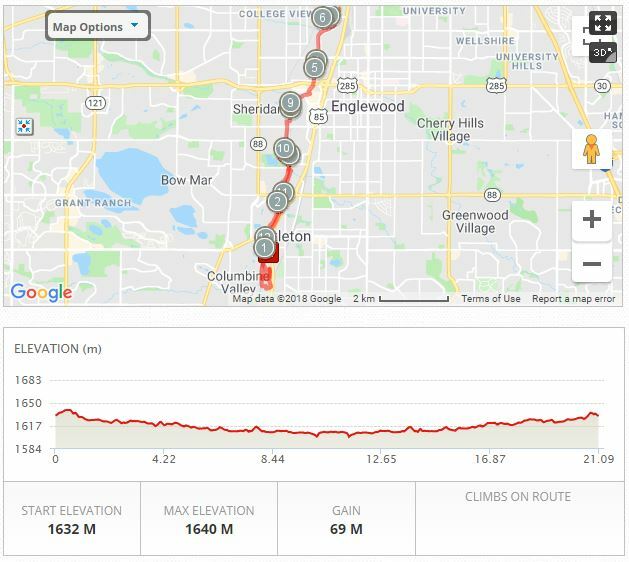 Starting at Hudson Gardens, the Snowman Stampede will run through the Denver Seminary before entering the Mary Carter Greenway Trail and then finishing with a loop around Hudson Gardens. All three races will start in front of the gift shop and run south on Vinewood and around the Denver Seminary before entering the Greenway. Runners will then run north on the Greenway Trail and cross over to the west side of the river at the first bridge. 5K runners will cross back over the river at the next bridge and then run south on the eastern side of the river back to Hudson Gardens. The 10K and half marathon runners will continue to run north on the western side of the river to the turn-around points. Then, 10K and half marathon runners will cross over to the eastern side of the river at the Big Dry Creek Trail and follow the Greenway Trail south all the way back to Hudson Gardens. Once back inside the Gardens, all runners will do one full loop of the outside of the park before finishing back in front of the gift shop. All registration and packet pick-up will take place inside The Inn at Hudson Gardens. The Inn is a wooden building located on the north side of the park. 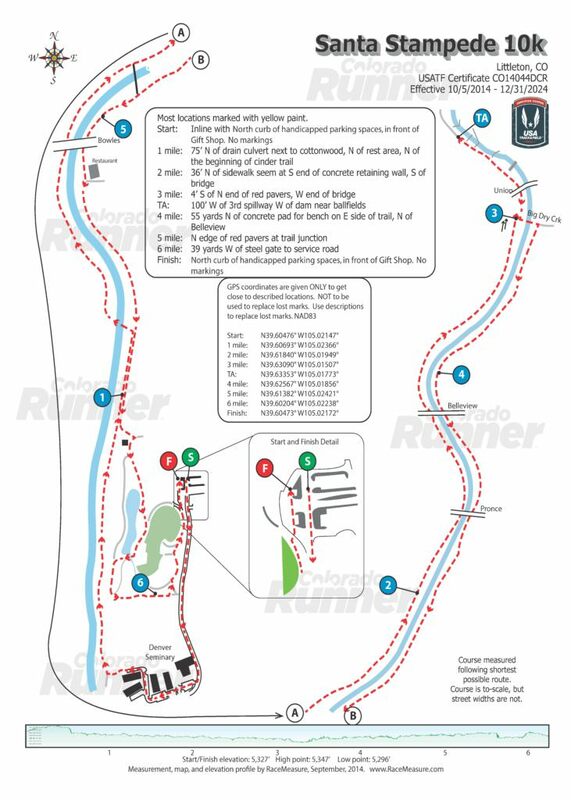 Below is an overview of how The Inn will be staged as well as an overview of the race start/finish area. The Inn will be locked at 10:30 AM. Any items left inside will be put on the front porch. The Snowman Stampede will be staged from Hudson Gardens in Littleton. Hudson Gardens is located on US Route 85 (S Santa Fe Drive), directly across from Arapahoe Community College at 6115 S Santa Fe Dr, Littleton, CO 80120. Overflow parking will be at Arapahoe Community College. From Denver, travel south on US 85 from I-25 or US 285. Hudson Gardens is located on the west side of the road. From Colorado Springs and Castle Rock, travel north on I-25, then west on C-470. Exit at Santa Fe Drive (US-85) and travel north. Hudson Gardens is located on the west side of the road. For detailed directions from your home, click the marker in the map and type in your address. Parking can be found in the southern lots of Hudson Gardens as well as the parking lots at Arapahoe Community College. If you would like to volunteer for this event you are of course more than welcome! 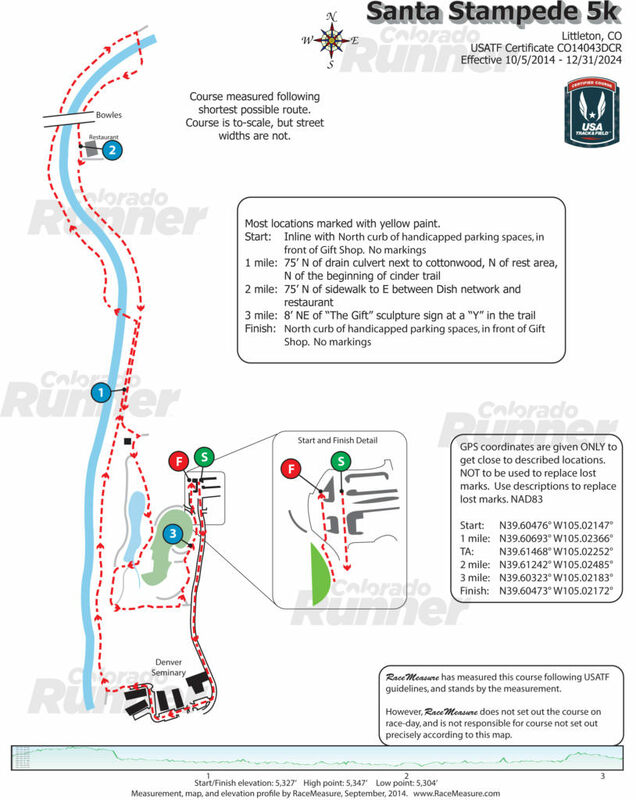 Please get in touch with Colorado Runner Events and they will be able to assist you with the details of the process. Aid stations will be located at mile 1.5 in the 5K; 1.5, 3, and 5.25 in the 10K; and 1.5, 3, 4.5, 6.5, 8.5, 10.5, and 12 in the half marathon. They will have water and Gatorade. The 6.5 mile aid station in the half marathon will have gels. Bicycles, skateboards, roller skates, and animals, are not allowed in the race. Dogs at not permitted on the grounds at Hudson Gardens and due to the out and back nature of the course, we are not allowing dogs on the course. Please leave your pooch at home. Failure to adhere to this policy will cause disqualification and may force Hudson Gardens to pull our permit for the event. The only reason Im not giving five stars for the course is because some of it wasnt plowed and it had snowed 6 inches the night before. The Greenland Trail Race offers four outstanding distances in southern Douglas County. Run the 4 Miler, the 8 Miler, the 25K, or tackle the 50K ultramarathon, Colorados fastest 50K! With Pikes Peak as your backdrop, youll cruise over a soft dirt trail on your way to a new personal best. With chip timing, an innovative technical running shirt in mens and womens sizing, food and beer at the finish, this race will make you want to come back for more! The Little Miami Half Marathon and 10K near Cincinnati is a flat and fast scenic race run along the banks of the Little Miami River. Are you training for a fall marathon or half marathon? This Cincinnati Half Marathon is a perfect tune-up! Plus, the entire course is run on a shaded bike path, which is a big bonus during Ohios humid summer months! The race starts and finishes in Morrow, OH, just a few miles east of Kings Island, and travels through South Lebanon and Kings Mills. All runners and walkers welcome. A technical running shirt, finishers medals, chip timing and great post race food at the finish are guaranteed to make this race a kickin good time! The Donut Dash 5K and 10K is Denvers race that ends with donuts. Runners and walkers can take advantage of a flat and fast course, and then enjoy fresh donuts at the finish. Our mission is to bring people together to have a fun, fit morning, all while supporting the many different needs throughout our region.